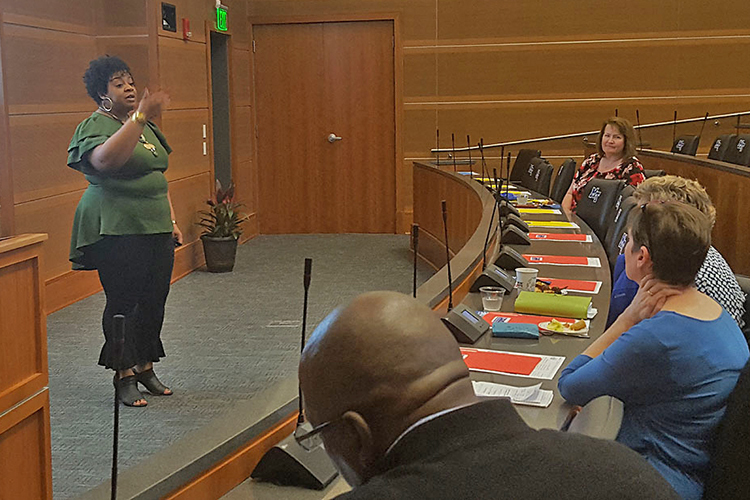 Author and social justice advocate Tony Porter never minces words when discussing issues surrounding gender-based and domestic violence and how to combat it. The co-founder and co-director of “A Call to Men: The Next Generation of Manhood” pointed out that while most men aren’t abusive, they are part of an overall male psyche that has allowed abusive behavior to persist. His organization’s mission is “to challenge this body of men to think and act differently, to step up and understand that these men who are abusive actually can’t be who they are without our permission,” he said. 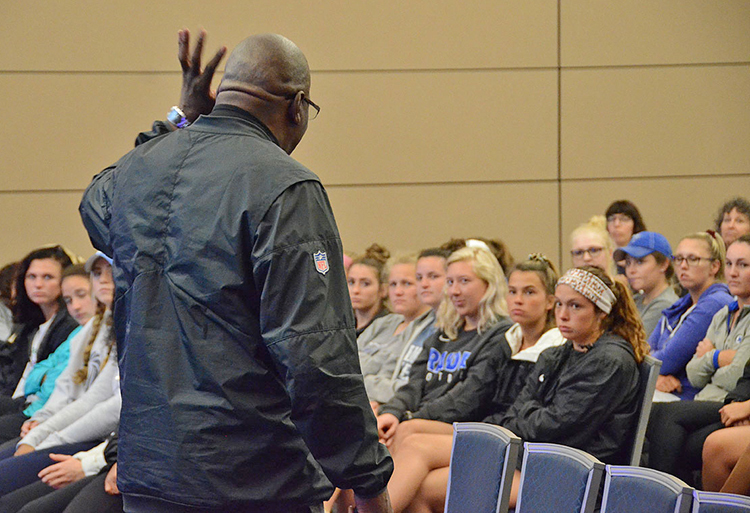 Porter, who first visited MTSU in October 2014 during Domestic Violence Awareness Month, returned to campus this spring for two public sessions Monday night in the second-floor ballroom of the Student Union — the first session geared toward women and female student athletes, while the second focused on men. 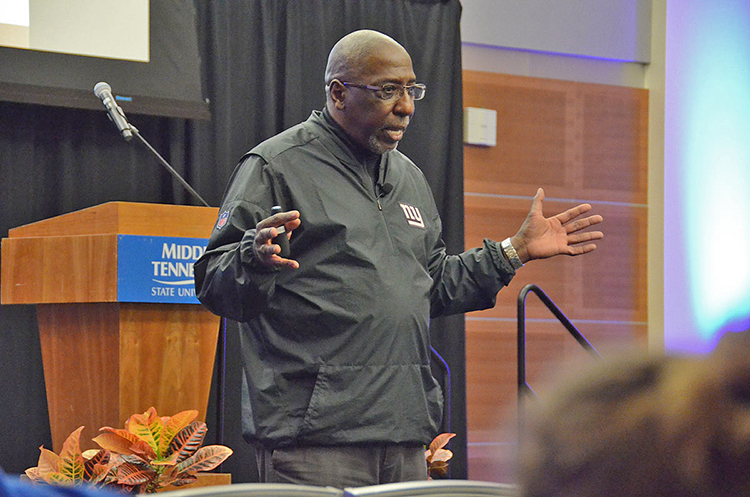 Earlier in the day, Porter spoke to a group of MTSU faculty and staff about the issue. 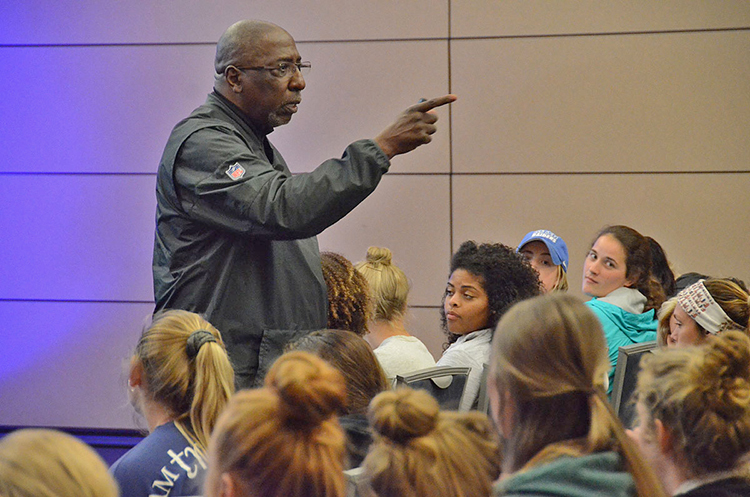 Porter’s April 8 appearance is part of MTSU’s observance of Sexual Assault Awareness Month and was sponsored by MTSU Athletics, the MTSU Power of One student organization, the university’s Distinguished Lecture Fund and the June Anderson Center for Women and Nontraditional Students. 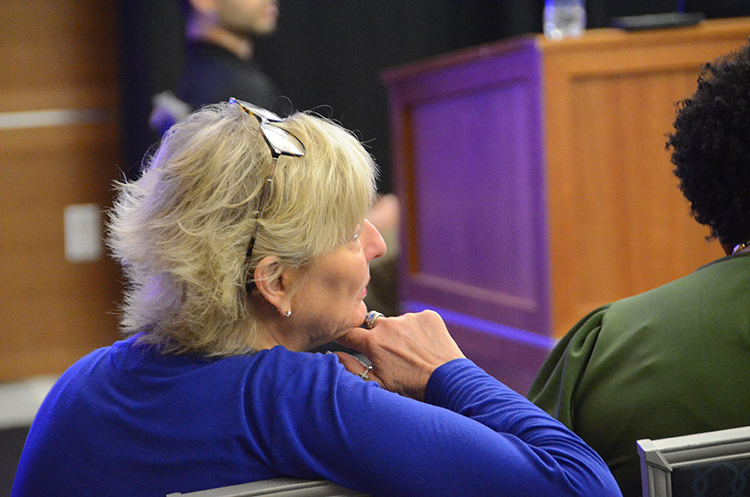 Associate athletic director Diane Turnham told the first session attendees, a crowd of about 100 mostly female student athletes, that Porter’s insights complement the ongoing awareness efforts by MT Athletics each year to discuss issues surrounding sexual harassment and sexual assault. Porter’s “A Call to Men” organization aims to prevent violence by shifting “social norms” and promoting a healthier, more respectful “definition of manhood,” according to its website, www.acalltomen.org. 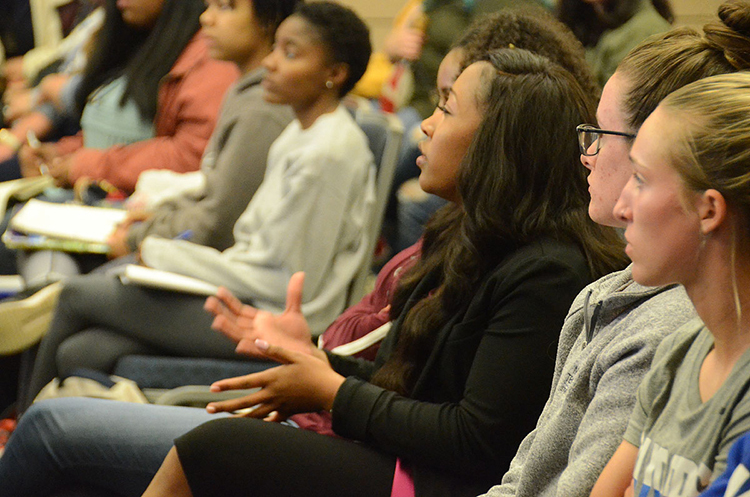 At Monday’s session, Porter walked around the ballroom, asking pointed questions of the young women about issues such as relationship dynamics, consent and signs of abuse (physical and psychological), while directing their attention to sobering statistics within his PowerPoint presentation, such as the fact that 1 out of 5 women between ages 16-24 will be sexually assaulted. “We’ve got a lot of work to do,” he said. “We have to begin to challenge men, and put the question before them … How is it that this many men (who are abusers) foster this epidemic of violence against women and girls in the presence of all of us who wouldn’t? How does that happen? The author of “Breaking Out of the ‘Man Box’: The Next Generation of Manhood,” Porter has worked for more than a decade as a life skills trainer and consultant for the National Football League. “It is a pervasive issue that affects everyone, regardless of their gender identity,” she said. For more information, contact the June Anderson Center at 615-898-5812 or jacwns@mtsu.edu.